For 110 years, General Motors has been making cars with steering wheels and pedals. But that just changed. The carmaker's self-driving arm, Cruise Automation, on Friday unveiled the latest version of its autonomous vehicle -- and the manual controls have been removed. Cruise, which is based in San Francisco, expects to test the modified Chevy Bolt next year. 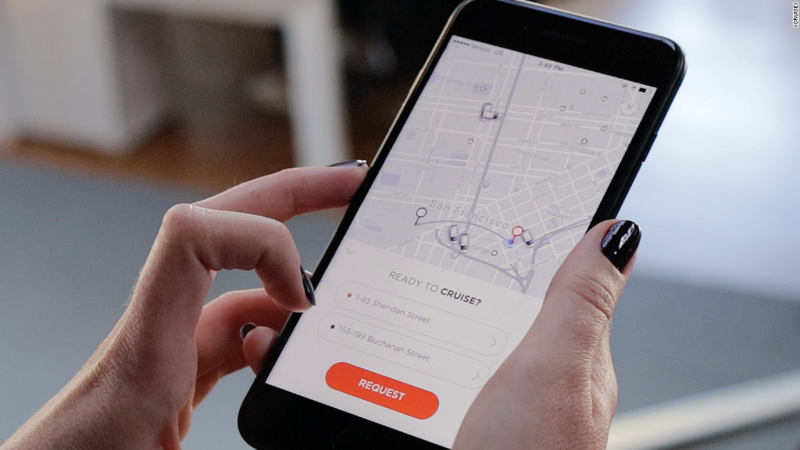 Eventually, it should serve in ride-hailing services in cities across the U.S. The autonomous cars currently being tested by major companies still have manual controls. 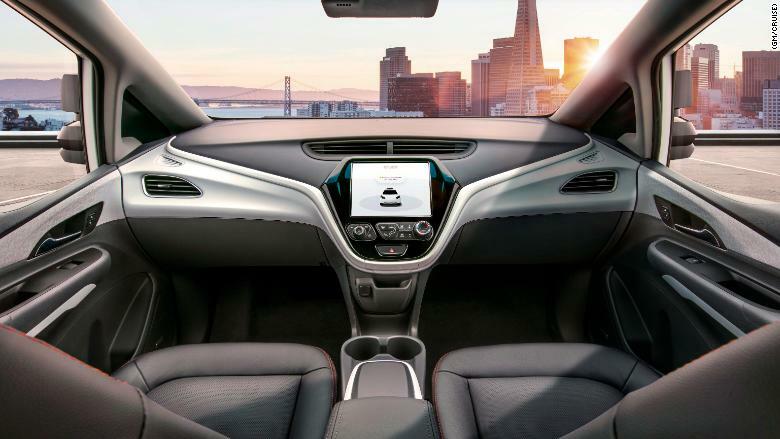 But because the new GM vehicle is fully autonomous, the company says there is no need for manual controls, such as a steering wheel or accelerator and brake pedals. Instead, the car has several interior screens that passengers can use to communicate with the vehicle. GM (GM) sees the announcement Friday as a significant step toward the widespread adoption of self-driving vehicle technology. But before it can use the new vehicles, GM will need special approval from the federal government. The company has filed a petition with the National Highway Traffic Safety Administration, requesting exemptions from 16 safety standards. It says these aren't relevant because the vehicle doesn't have manual controls. "When you don't have a steering wheel, it makes no sense to talk about an airbag in a steering wheel," Paul Hemmersbaugh, GM's policy director for autonomous vehicles, told reporters. "So what we do instead is put in an airbag that mirrors the right front passenger side, and show it provides equivalent safety." GM is requesting that 2,500 vehicles receive exemptions. That's the maximum number the government will currently allow for each manufacturer. The government views the exemptions as a way to bring the benefits of autonomous vehicles to public roads while regulators are still adapting existing laws for the new technology. Cruise also released a safety report Friday detailing the steps it takes to ensure its vehicles are ready to drive on public roads. Cruise accounted for 22 of the 27 autonomous vehicle crashes in California in 2017. It has previously pointed to the challenges of testing in dense urban areas. In October, Waymo, the self-driving unit of Google's (GOOGL) parent company, released a safety report of its own. Earlier in the fall, the federal government had requested more safety details from the self-driving car industry. Cruise wouldn't say where it will eventually deploy the new vehicles or how soon the public will be able to ride in them. Arizona is one possible destination, as Cruise is already testing some of its other vehicles there, and the state's regulations are friendly to autonomous vehicles. Some of Cruise's competitors, including Uber and Waymo, are also testing in Arizona. The Uber and Waymo test vehicles still have steering wheels and pedals. Waymo announced in November that it was removing test drivers from the front seat. It plans to launch a commercial service in the Phoenix area this year.